Madame Bollinger created the first vintage of this now legendary prestige cuvée, Bollinger R.D., in 1961 with the launch of R.D. 1952. An acronym for Recently Disgorged, Bollinger R.D. is the result of Madame Bollinger’s great vision: an expert wine with aromas enhanced by its exceptionally long maturation in the Bollinger family cellars – more than three times longer than required. 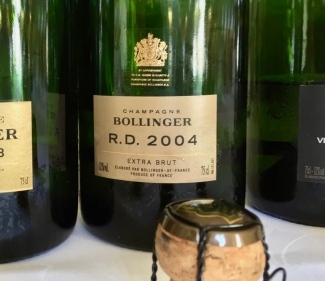 Since then, just twenty four vintages have been released and this year we will see the twenty fifth: Bollinger R.D. 2004. Made exclusively from the first press of juice (tête de cuvée) from Grand and Premier Cru vineyards only, bottled under natural cork during second fermentation (to improve ageing) and treated to manual riddling and disgorgement, this is seriously prestige fizz. As R.D. is La Grande Année that has been aged on the lees for much longer, developing newfound levels of complexity and intrigue, the assemblage is no secret: 66% Pinot Noir and 34% Chardonnay, just sightly more Pinot Noir than the 60% content of the last vintage: Bollinger R.D. 2002. This unique expression of the generous and ripe 2004 vintage has spent over 12 years ageing underground in the cool, dark chalk cellars of Champagne. During a visit to the house in Aÿ last year with Jancis Robinson MW, we were fortunate enough to taste a bottle of R.D. 2004 with head winemaker Gilles Descôtes and COO Jérôme Philippon and were blown away by its abundance of fruit-forward flavour and masterful youth. Very tight at the time, this is sure to open up into a delicious ode to the remarkable vintage of 2004. We will have more news upon its release in March. Has quite a forward nose, lots of peach and apricot fruits and on the palate the classic dried fruit character and nuttiness comes through. At this very young stage the oak seems quite prominent. Quite closed at the moment. Bollinger R.D. 2004 – Now available to purchase in bond and at retail.